Here's Number 10, Number 9, and Number 8. Onward to Number 7! 7. J'onn J'onzz likes Earth. For a minute, put aside all that cone-headed post-52 full-body-suited goth version of the Martian Manhunter. Clear your mind of all that angsty "why should I help humans" nonsense. On more than one occasion in his Silver Age appearances, J'onn had the opportunity to leave Earth. And he always chose to stay, either because he wanted to keep helping us, or because he remembered his Earth friends, or because he just wanted to do the right thing. You know, heroes did that back in the day: sacrificed their own needs to serve the greater good. It's kind of the definition of the word "hero." J'onn chooses to apprehend a criminal rather than escape back to Mars. 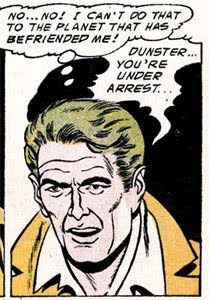 What makes this even more impressive is that this is from an early appearance, where no one even knew who the "Martian Manhunter" was--he hadn't yet gone public as a superhero, just used his powers covertly to solve crime. He hadn't gotten any public adulation, just everyday human decency and friendship, yet he still considers Earth a welcoming (albeit lonely) place. Whereas I would've been like, "Screw it, I'm going home to my family and my dog," J'onn takes the high road because he's a class act. Bottom line: he likes Earth. He likes Earthlings. He considers Earthlings his friends. He wants to help Earthlings. Got it? Good. Now don't forget that. And don't let any emo-body-suited Martian Manhunter impostors tell you otherwise. Whole heartedly agreed. Cookies, intrigue, and Justice buddies; What's not to like? I see (modern)J'onn taking the long view, always seeing the best of the situation. I see him, after the destruction of his people, seeing Saturn as a place similar to his old life, and while acknowledging them, keeping a distance. On Earth, he is not one of the maker's, but in fact one of many superpowered beings protecting this relatively underdeveloped world. That, combined with recent Green Lantern developements sets up MM as the defender of the solar system pretty nicely. The whole "why should I help humanity when..." thing is the furthest thing from a J'onn reaction. If we take into account his future actions (e.g. trying to save planets that some would say are hell holes and far less worthy than our planet), then it totoally doesn't make sense that J'onn would go in the above questioning (disillutioned) direction. Liss, did you read my reply in my 1000 faces post. I give some instruction I forgot to post earlier. m.c., seeing MM as the guardian/protector of the Earth and our solar system would be a nice character development. As long as he doesn't forget to spend some time down on Earth. Thanks for posting the instructions! I replied over at your blog.